To display diagrams inside the Utility Bar for a Lightning App the managed package integration must been installed into a Production Org, the Org has been connected to a Space in Elements (Free or Pro), and user provisioning has been setup so that Salesforce users have a user account in Elements. A Lightning component "ElementsDiagramView" is installed with the Elements Catalyst managed package. The diagram that gets shown is determined by the order of following rules. If a Diagram ID has been specified for the Record Type use that. If a Diagram ID has been specified for the Object User use that. Use a the default Diagram ID setup in the component. To specify a diagram ID for the Record Type or Object go to the Element Settings tab of the Elements App in Salesforce. Select the Objects sub tab and against the Object or Object/Record Type enter the Diagram ID of the diagram to show. 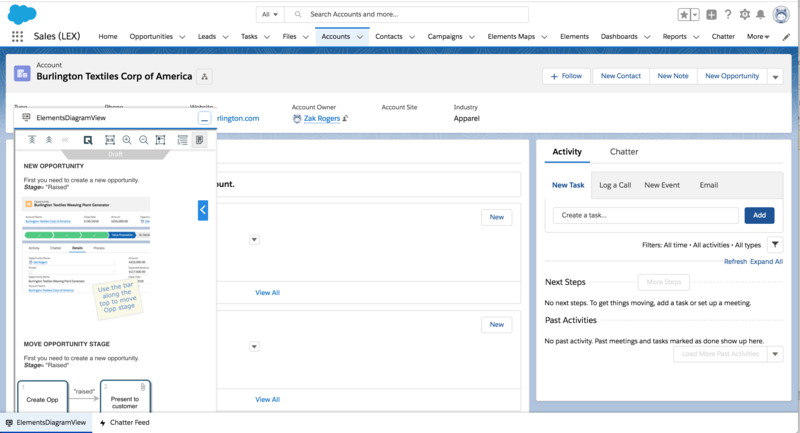 In Salesforce Setup go the Lightning Experience App Manager and edit your App. In the left bar select Utility Items. Then click Add Utility Item. Scroll down and select ElementsDiagramView. Configure it in the right panel. If no diagram is set for the Object/Record Type and there is no default diagram set them an error message is shown when the utility bar is opened. Here is an example, with the content displayed in the Utility Bar.